for 30 days of unlimited access with promo code THEGIFT. For any of you who have joined me in a yoga class (or writing class!) you know that I love incorporating guided meditations and imagery into my teaching. The reason I love it so much is twofold. First, meditation practices are a great way to get us into our bodies and into the present moment where both learning and healing take place. Second, meditation enhances creativity, and research backs this up. Overall, meditation helps you tap into and release any blockages that might be stumbling blocks to your creativity. The practice is about freeing up space and letting go. When we surrender to just being, creativity and inspiration have room to play. It’s perfect for both new and well-versed practitioners. For those who have not tried to meditate, it can be intimidating. However, research has shown that prior meditation experience is not necessary to access its benefits. It’s true that meditation’s wide-ranging health benefits increase with regular practice, but it’s also true that the very first time you pause to meditate, you can take an active role in cleansing your mind and cultivating inspiration. For beginners, Ananda provides an easy introduction into the world of meditation. And, for those of you that have already dabbled in meditation, or find your way to your ‘cushion’ on a daily basis, Ananda allows you to deepen your practice. Ananda helps you make time to meditate. Guided meditation is reviving, energizing, healing, and most of all, freeing, leaving you with more room to dive into your creative and writing practices. The Dalai Lama wrote that the more he has to do in a day, the more time he sets aside for meditation, meaning that meditation is really the creation of space—when we give ourselves more headspace we actually create more focus and more freedom for the flow of ideas. Think of your meditation like a coffee or tea or whatever type of break rings true for you. You truly have 10 minutes for yourself, and Ananda provides ease of access to your practice with a simple click. And my favorite: it’s completely customizable. Ananda is like walking into a meditation buffet where you can sample and melt into a wide selection of guided meditations based on the mood you’re in and the amount of time you have. The platform allows you to pull together your favorites by creating your own playlists, listen to themed playlists, or check out what is trending. One of my favorite features is the ability to mix and match music tracks with the different meditations, choosing the background audio that resonates most with my mood in that moment. In writing, the key is to keeping the reader engaged is not waking them from the dream you are producing; Ananda allows you to sink into this dream state of meditation by highly personalizing your choices. Since I’m a creativity junkie—craving anything that inspires and lights up those innovative centers of my brain—I’ve pulled together some of my favorites from Ananda, curating a playlist to ignite your creativity as you start your meditation adventure. When you log into Ananda, look for the playlist “Healing Your Creative Soul.” Creativity is about trust, nourishment, and empowerment, and you’ll find the ability to tap into all three of these with this list of meditations. After your meditation practice, I encourage you to pick up your pen and write. Ananda is a subscription based program, and with this special offer from the Chopra Center, you can explore Ananda for an entire month—30 free days of unlimited access! 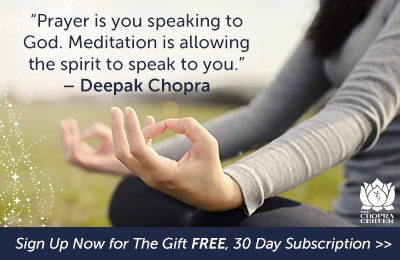 Check it out here and use promo code THEGIFT to unlock your personalized meditation experience. Be sure to claim it as soon as possible as it expires at the end of the year, and share with others who would benefit (ie: all of us!). Disclaimer: This post is sponsored by The Chopra Center, however, all opinions and thoughts are my own, and based on my experience with Ananda.